Classic Caesar Salad is really just that: Classic. This Classic Caesar Salad truly is the real deal. 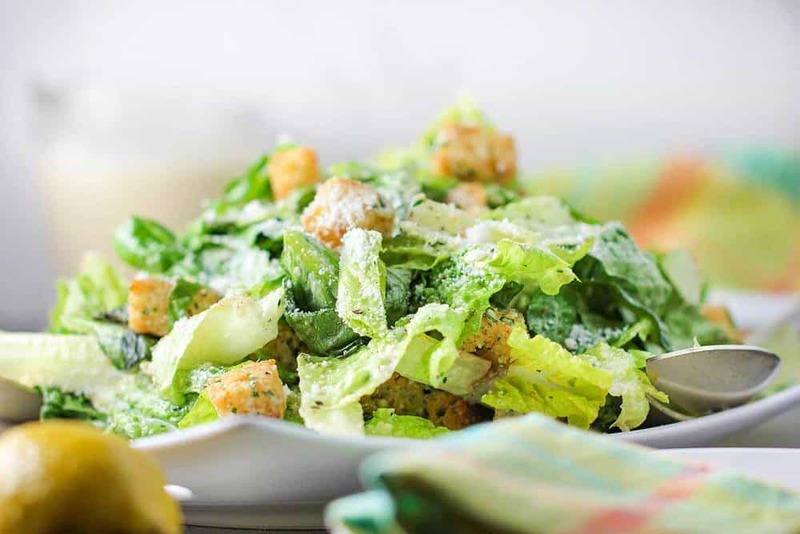 We just love a well-made Caesar salad. It’s hands down, the Loon’s favorite salad, and is right at the top for me, too. 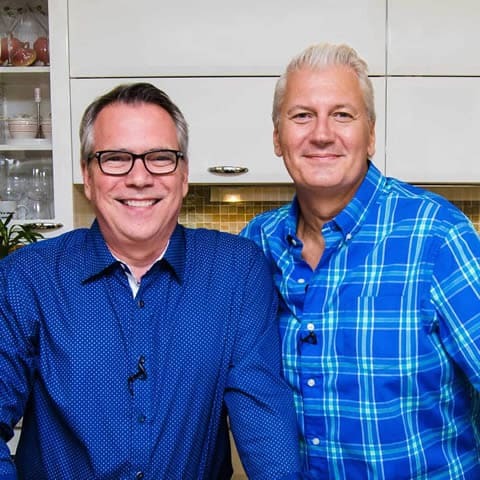 Watch us show you how easy it is to make a Classic Caesar Salad! It all starts with a beautiful head of romaine lettuce. We like to tear the lettuce into large, bite-sized pieces. A knife or your hands can do this in a snap. Wash the cut lettuce, then dry it off, then let it crisp in the refrigerator for a few hours. 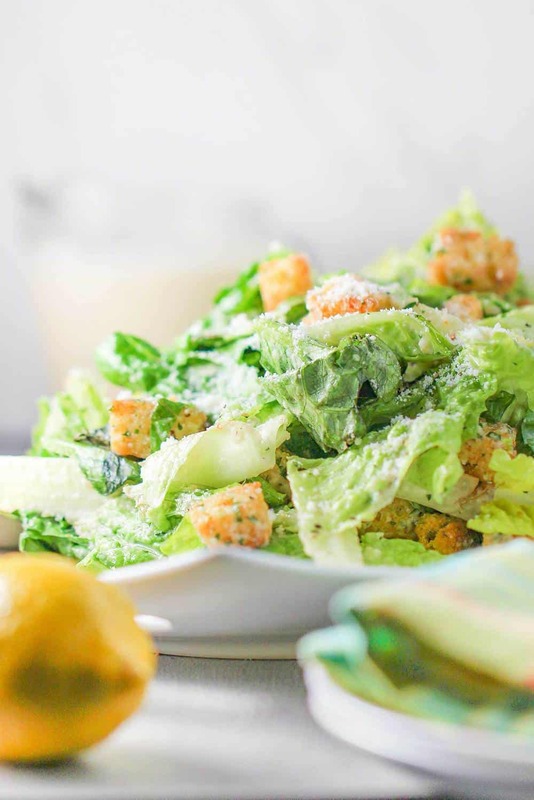 It may seem like a lot of trouble making your croutons for this Classic Caesar Salad, but trust us, it’s not! The crunch of the toasted little squares of fresh bread just can’t be beat. They only bake for about 15 to 20 minutes, until crunchy and golden. Be sure to toss the croutons around on the pan mid-way through baking. The layers of flavor makes them irresistible. And an added coating of Romano cheese and fresh parsley is perfection. 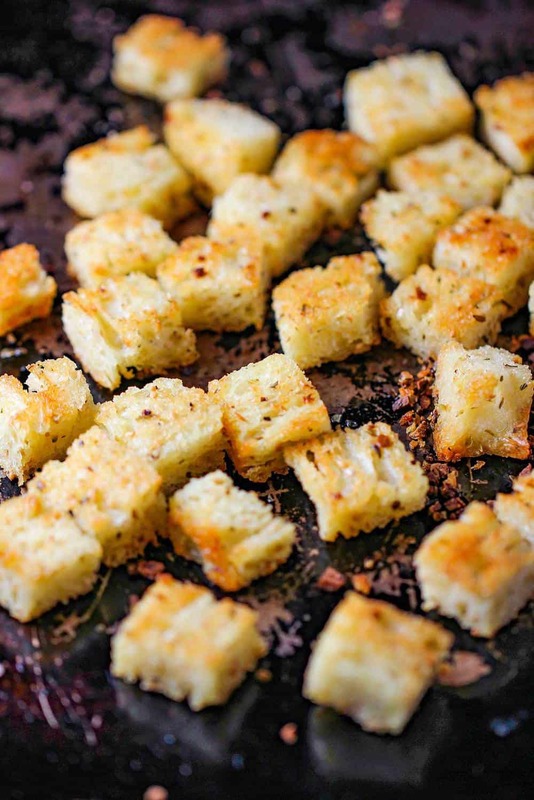 Let us tell you again, don’t skip making these croutons for Classic Caesar Salad. And the great thing is they can be made up to 24 hours in advance. 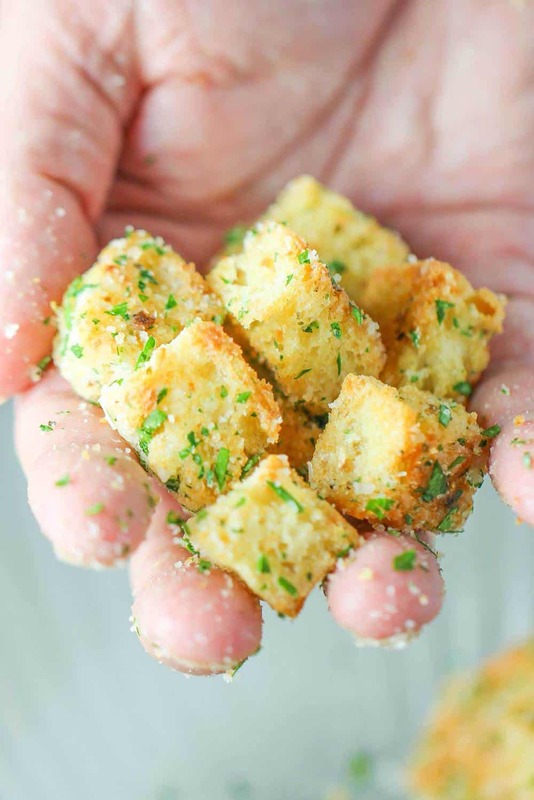 Oh, how we love homemade croutons! We use our food processor to emulsify the Caesar dressing ingredients. Don’t be afraid of the anchovies, they truly do give Caesar dressing it’s distinct taste. You’ll need 1 cup for this recipe, save the leftovers for other uses. It’s great as a sandwich spread! It’s important to let the dressing sit in the refrigerator for at least 4 hours. This not only allows the flavors to meld, but the dressing will thicken, too. 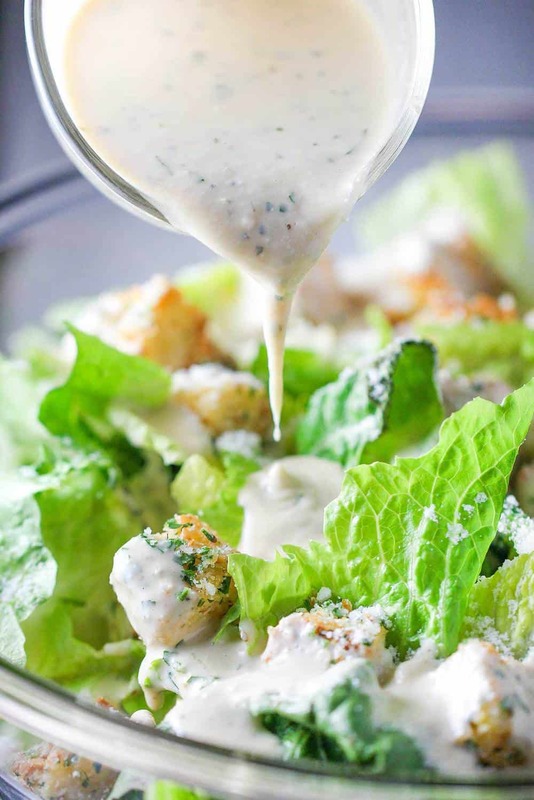 You are going to love this Classic Caesar Salad! The dressing is as good as you’ll find anywhere! We don’t know what more to say about this amazing Classic Caesar Salad. You can prep all the components well in advance of serving. And then assemble just before your guests are ready to eat. 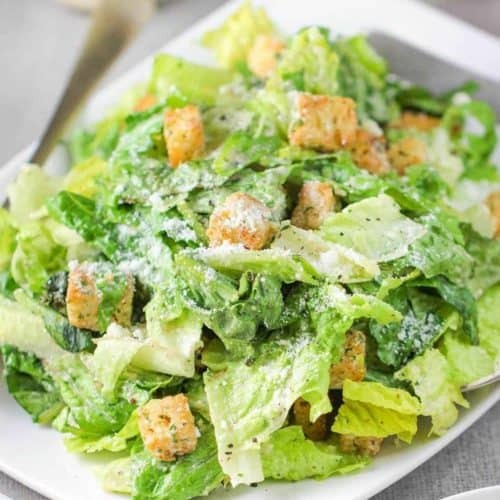 We love serving this Classic Caesar Salad as a first course when serving our favorite Italian dishes, such as Chicken Parmesan, or Baked Ziti, or Shrimp Scampi. No matter what you serve this with, your guests will love this salad. It is authentic, yet easy to prepare. 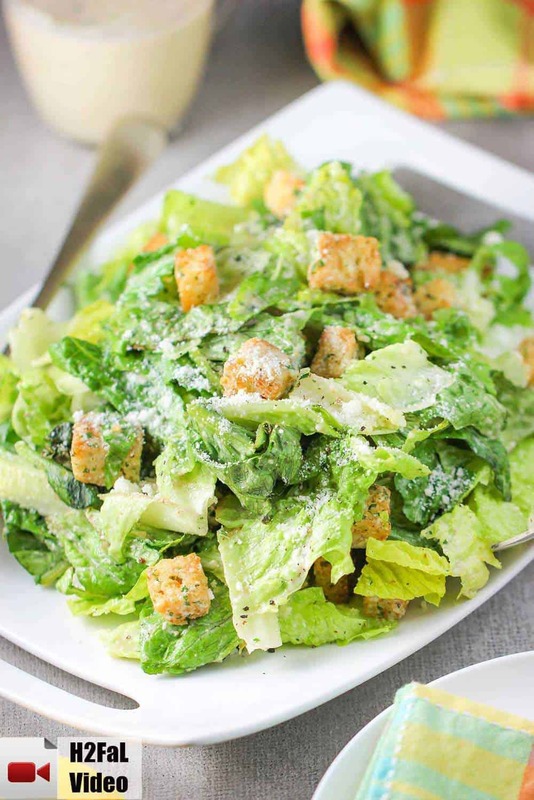 Now is the time for: Classic Caesar Salad. Made-from-scratch Classic Caesar Salad is so good. Perfect start before a fabulous pasta dish. All the components to this authentic salad can be made in advance. Simply assemble just before serving. This is the real deal! In a blender, or food processor, puree the 6 anchovy fillets. Add the garlic and pulse until the mixture is well blended. Add the egg yolks and blend the mixture for about 2 minutes. Turn off the motor, add the vinegar and lemon juice, and pulse for another 30 seconds. With the motor running, add the olive oil in a slow, steady stream until it is incorporated. Add the cheese, parsley, and oregano and pulse the mixture for 10 seconds. Season the dressing to taste with a pinch of salt and pepper. 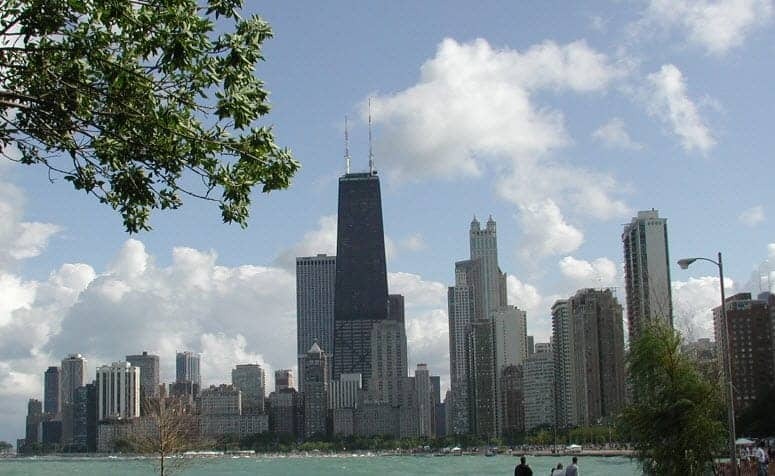 Transfer to a glass or container with a tight fitting lid, and refrigerate for at least 4 hours and up to 24 hours. Chilling the dressing thickens it, and the thicker it gets, the better it sticks to the lettuce. In a large mixing bowl, stir together the olive oil, garlic, and oregano. Whisk the mixture well. Trim the crusts from the bread and cut each slice into 1-inch squares. Place the bread cubes in the bowl and toss them until they are well coated. Spread the bread cubes on a baking sheet and bake them for 15 to 20 minutes, stirring at least once, halfway through baking, until they are crispy and browned. 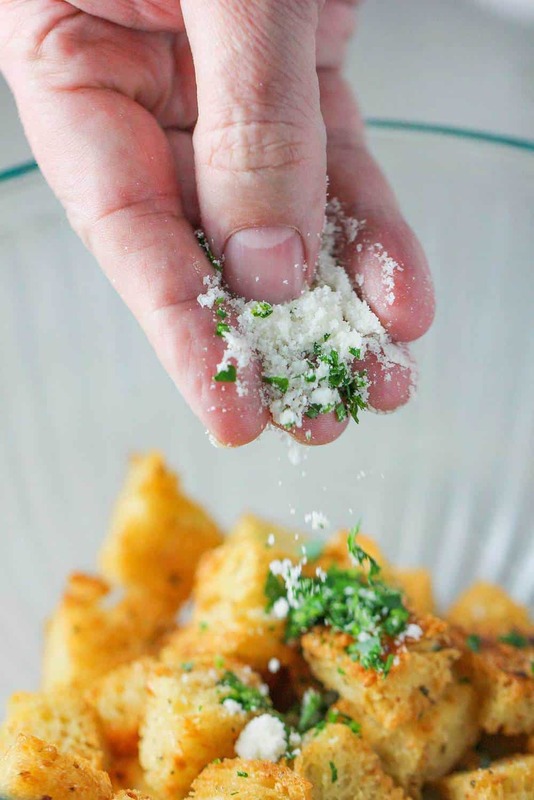 Transfer the croutons to a bowl, add 2 tbsp of the cheese and the parsley, and toss them together well. Set aside. 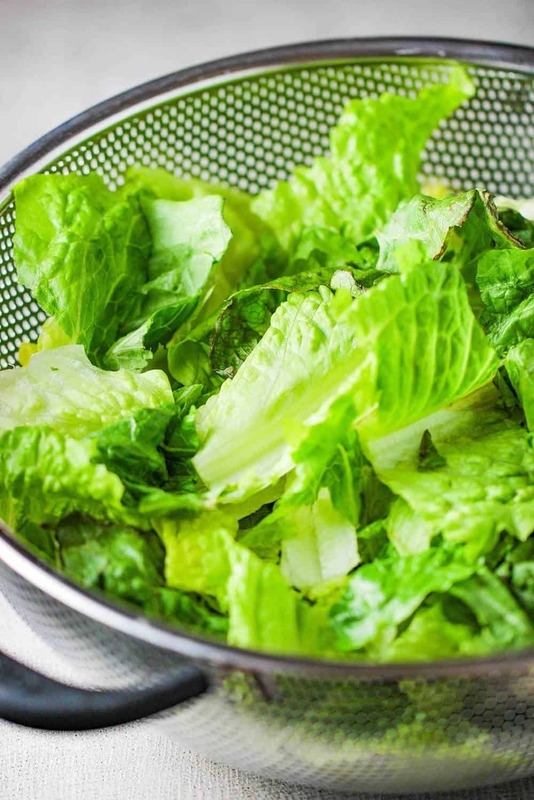 Using your hands, or a large sharp knife, cut the lettuce into bite-sized pieces, and then wash thoroughly under cold water. Dry with a salad spinner or with paper towels. Transfer the lettuce back to your colander and cover with a kitchen towel, or into large plastic baggies (left open) and refrigerate until very cold and crisp. Usually a couple hours. Place the lettuce in a bowl. Add the croutons and 2 tbsp of the cheese. Spoon 1 cup of the dressing over the salad and mix them together well, using your hands or tongs. Reserve the remaining dressing for another use. Pile the salad on a platter and top it with remaining tbsp of cheese and freshly ground black pepper. Place the 3 anchovies on top of the salad is using. Serve at once! Hi guys! 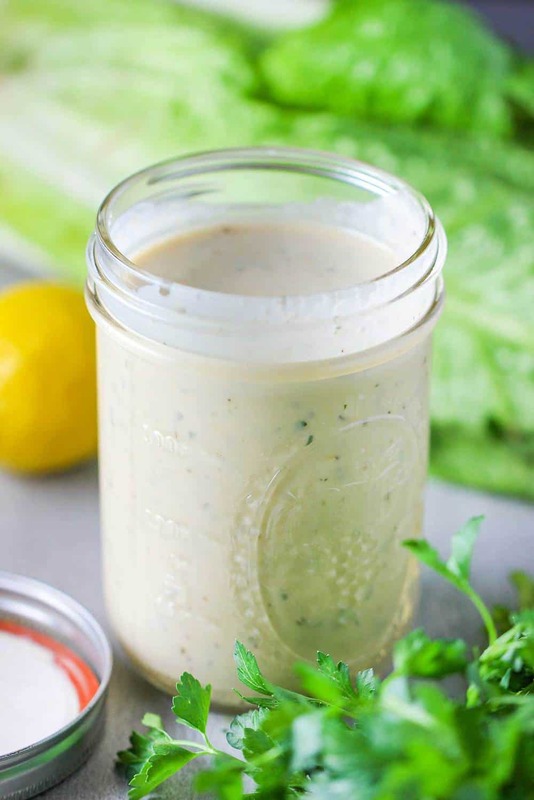 Have you tried making the dressing with an immersion blender? That word “emulsify” got me thinking about it. The clean up is just so much easier. Your opinion?